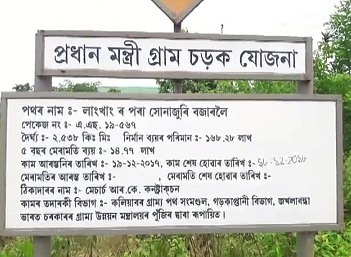 Allegations are rife that rampant corruption is going on in the construction of the 2.538 km road under Prime Minister’s Gram Sadak Yojana (PMGSY) connecting Sonajuri market and Langkhang at Kaliabor in Nagaon district of Assam. Locals have alleged that the passive role played by the Public Works Department (PWD) has encouraged the contractors to use sub-standard materials in the construction of the road under PMGSY. A budget of Rs 168,28,000 was sanctioned for the construction of the rural road under PMGSY. However, locals have alleged that to reap more profits, the contractors are using sub-standard materials and the concerned authorities are also turning a blind eye to the whole matter. Concerned circles have alleged that the stones and the sand are of very inferior quality used by the construction company named M/s R K Construction. 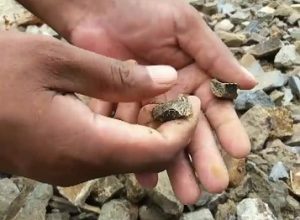 They have alleged that the stones are of so inferior quality that they are crushed immediately rollers move over these stones. Locals also alleged that though the matter was brought to the notice of the concerned authorities, nothing concrete has been done in this regard yet.